Channel letters are typically the most preferred type of sign due to the simple fact that they express your company's name in the most visible way possible. Channel letters allow you to incorporate your company's fonts, logos, colors, and style throughout your new sign. 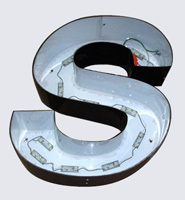 Channel letters are made from aluminum and are internally illuminated with low voltage, long lasting, bright LED lighting. Channel letters can be individually mounted directly to a building or raceway mounted. A raceway is an aluminum box which holds all wiring and on which all letters are attached. The raceway is mounted directly to the building leaving very few holes in the fascia. These different mounting styles are typically determined by most landlords and can be found in the supplied sign criteria.